Photograph courtesy Tony Sayer 25210 Toton September 18th 1982. Two days earlier (16th) 25210 had worked the 18.30 Crewe - Derby after the diesel multiple unit failed. 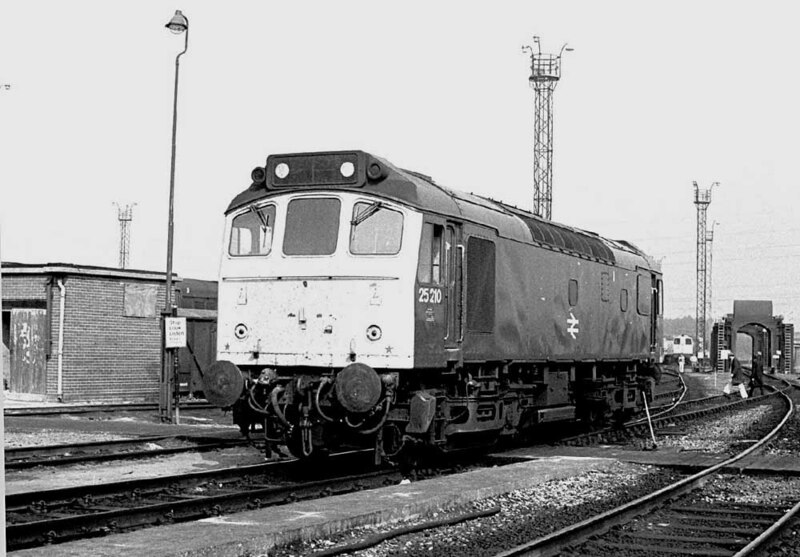 The twenty year career of D7560/25210 was spent entirely allocated to LMR depots. Time between withdrawal and scrapping: 11 months (cabs lasted a little longer). November 1967 to Springs Branch (8F), then to the Liverpool Division. 25210 was the 241st Class 25 to be withdrawn. After withdrawal 25210 was stored at Crewe Gresty Lane before moving to Doncaster Works with 25237 & 25298 as the 9Z38 10.20am Crewe Gresty Lane – Doncaster Works on January 23rd 1986. 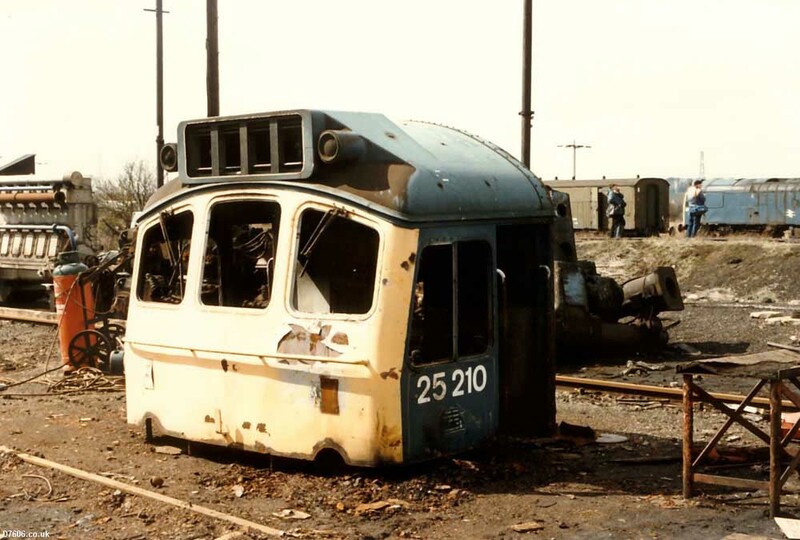 By the end of March most of the locomotive was gone, the cabs lingering until the end of July 1986. Noted Derby Works September & October 1978 (Classified & dual braking). 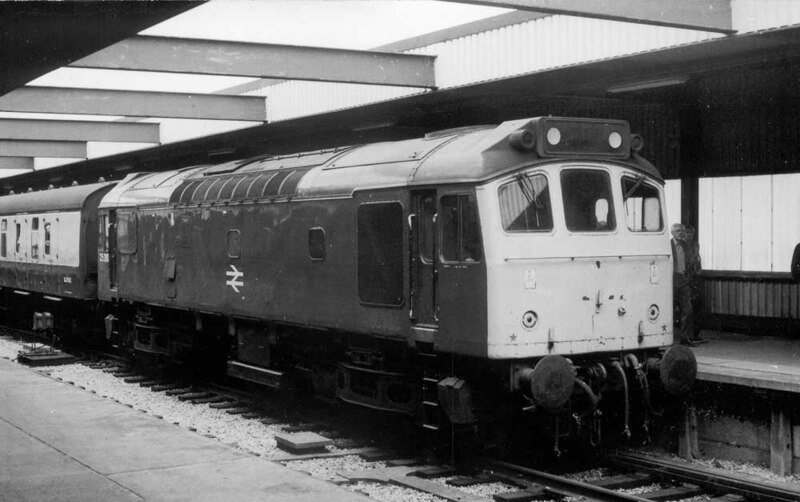 One of the earliest passenger workings for D7560 occurred on August 6th 1966 when it worked the 08.36 Nottingham - Llandudno Town and return with D7543, a working which over the years would see haulage by many Class 25s. With 7560/25210 being allocated only to London Midland Region depots the vast majority of its workings originated on the LMR, either as the familiar summer dated services or the regular services diagrammed for Class 25s from time to time. 7560 wandered onto the Southern Region on November 12th, working in on the 20.05 Ellesmere Port - Wareham, returning on the next morning’s 08.28 Fratton - Trafford Park. The Billingham - Grangemouth ammonia train was worked throughout by 7603 & 7560 on April 27th. The Coventry - Nuneaton line was visited by the area manager using saloon M45026 hauled by 7560. Singling of the line was under consideration. On August 5th the 21.30 Leicester - Birmingham New Street was worked by 7560. The Southern Region continued to receive Peaks on the Toton – Brent – Southfleet coal trains, occasionally paired Class 25s substituted, during November 5270 & 7560 were noted. On June 29th 25210 & 25132 worked the 08.52 Leicester - Skegness and the return 12.30 Skegness - Leicester. On July 13th 25210 & 25272 worked a roundtrip Derby - Skegness. 25210 & 25273 worked on August 31st the 08.00 Walsall - Yarmouth to Norwich and the return 14.15 Yarmouth - Derby from Norwich. January 11th 31208 & 25210 worked the Tyneside CFD – Kings Norton freight. 25210 worked the 8B40 Whitemoor - Hitchin freight (via Royston not ECML) on February 14th. On May 24th 25210 & 25046 worked the 08.52 Leicester - Skegness and the return 12.30 Skegness - Leicester. A Euston - Glasgow Central relief on July 20th was worked Crewe - Chester - Warrington by 25210 & 25172. On August 31st 25210 & 25272 worked the 17.10 Birmingham - Newcastle, heading south the next day with the Heaton - Redbank empty vans, possibly as far as York as they were later noted at Rotherham with a Tinsley bound freight. Whe a diesel multiple unit failed with flat batteries on October 11th the 12.50 Carlisle - Newcastle was worked by 25210 with the multiple unit in tow. On May 29th 25210 & 25075 worked the 08.00 Walsall - Yarmouth to Norwich, returning from Norwich with the 14.15 Yarmouth - Derby. On July 10th 25210 & 25266 worked the 09.20 Derby - Skegness and the return 13.05 Skegness - Derby. On July 30th the 12.20 Birmingham New Street - Newquay was worked to Plymouth by 25210 & 25264 (this may have been the 09.34 Nottingham - Paignton). On November 8th ex-works 25210 was tested at Northwich on the Tunstead limestone service, working the 17.21 Oakleigh – Tunstead and return followed by the 02.57 Northwich – Tunstead. It then beat a hasty retreat to Longsight for repairs, not unexpected after dealing with these 1,250 ton trains. Further testing on 28th didn’t improve matters, it failed at Hazel Grove on the 11.03 Oakleigh – Tunstead, being removed to Buxton and then forwarded to Derby Works. 45074 & 25310 were noted northbound at Finedon with a mineral train on June 28th. On July 29th the 12.33 Rugby - Euston electric multiple unit was assisted between Northampton & Bletchley by 25210 due to the power being off for engineering work. On August 28th 25190 & 25210 worked the Cricklewood - Stewartby rubbish train. On September 29th 25210 was noted southbound through Doncaster with eleven well worn sand (?) wagons and a guard's van. On June 1st the 23.59 Sheffield - St Pancras was diverted at Bedford into Euston, being hauled from Bedford by 25210 & 25095. The Barrow - Red Bank vans were worked by 25210 on August 23rd. Two failures were assisted by 25210 on September 25th, the 07.55 Newcastle - Poole failed north of Chesterfield behind 45060, 25210 was obtained to drag the service forward but had some sort of brake problem. Eventually the train was assisted in the rear by 47278 and its merry-go-round working, all proceeding at a slow speed to Derby where everything was replaced at Derby by 47052. Secondly the 10.03 Matlock - Derby diesel multiple unit was assisted forward from Ambergate by 25210. 25210 & 25050 were noted at Northampton with an engineers train on March 23rd. A mixed engineers train was noted passing Ridgemont on May 17th in charge of 25210. A thirteen vehicle West Ruislip – Masborough train of condemned London Transport stock was noted on June 2nd behind 25210. On June 23rd 25210 was noted through Hinckley with cement empties. 25210 received an 'E' examination at Toton during July. 25210 was noted southbound at Sharnbrook with nine loaded HTV coal hoppers on August 26th. The 18.30 Crewe - Derby diesel multiple unit failed on September 16th resulting in 25210 working the service. 25210 & 25249 were noted at Leighton Buzzard on December 5th with an engineers loaded ballast train. 25210 was stabled at Longsight on May 24th. A week later on May 29th 25210 was stabled at Hooton. On June 1st 25213 & 25210 worked the Ellesmere Port - Exeter Riverside tar tanks. On June 18th 1983 25210 & 25211 handled the Manchester Railway Reunion Railtour between Morecambe, Heysham & Carnforth, a grand distance of about fifteen miles. On June 28th 25210 was noted heading north at Clifton with a tamper. Photograph collection of webmaster On June 18th 1983 25210 & 25211 top & tailed the Manchester Railway Reunion Railtour between Morecambe, Heysham & Carnforth, a grand distance of about fifteen miles. In this view 25210 awaits departure from Heysham. 25210 was noted eastbound through Chester on July 13th with short wheelbase cement tankers. On August 8th 25210 & 25176 worked the 1S01 11.15 Euston - Stirling Motorail forward from Carlisle as far as Polmadie. The next day 25210 headed south with the 13.50 Glasgow Central - Carlisle. The 08.40 Carlisle - Glasgow Central and the 13.50 Glasgow Central - Carlisle were worked by 25210 on September 16th. 25239 & 25210 were noted at Stoney Bridge, Skelton Junction on September 29th with empty cement tankers from the Blue Circle Cement depot at Northernden. 25210 was noted at Bescot Yard on January 14th. An empty set of ICI hoppers was worked from Northwich to Tunstead by 25210 on a very gloomy February 29th and on a much sunnier March 3rd. On a dull March 24th 25210 was noted passing Bromford Bridge with the SX 4D51 Lawley Street Terminal - Beeston freightliner service, comprised of five freightliner flats carrying eight containers. On May 27th the 14.10 Glasgow Central - Euston with 86230 was dragged by 25210 & 25322 between Preston & Crewe, the train diverted because of engineering work. Photograph courtesy Roger Geach 25210 & 40013 at Allerton on June 7th 1984. The previous day (6th) 25210 had worked the 18.04 Fords Halewood - Dagenham freight. On July 27th the 15.50 Glasgow Central - Carlisle with 27029 was assisted from Dumfries by 25210. 25210 was noted passing Edge Hill on August 29th. 25210's last recorded passenger workings occurred on September 6th working the 13.08 Barrow - Liverpool forward from Preston after the failure of 47484, and later in the day the 16.20 Glasgow Central - Liverpool forward from Preston. 25120 was stabled at Cricklewood on a snowy January 7th & 8th. 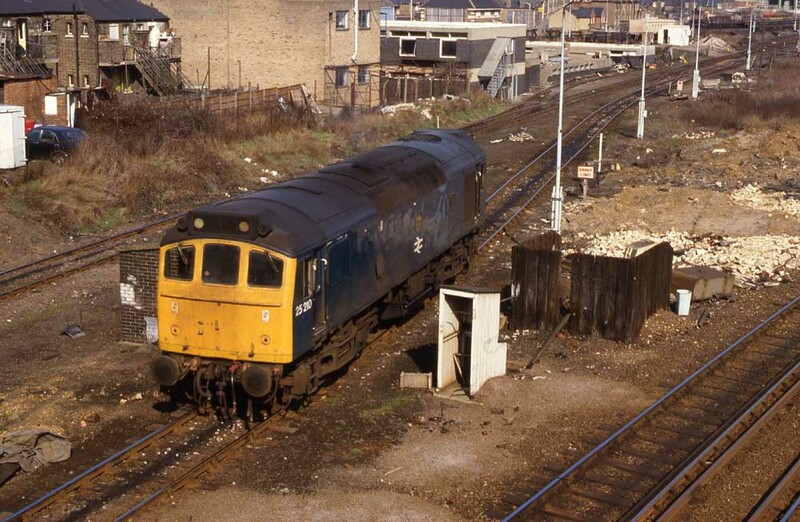 Photograph courtesy Peter Lovell 25210 South West Siding yard entrance Willesden March 9th 1985. 25210 was noted at Tyseley depot on March 31st. 25210 was withdrawn on April 30th 1985. 25210 became the first Class 25 to be broken up at Doncaster Works since 25015 in 1975. One of the cabside number panels was saved from scrapping. 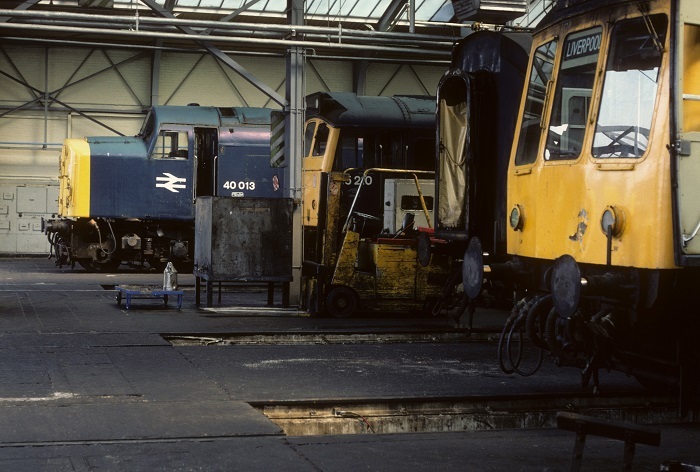 Photograph courtesy Ian Hammond 25210 cab at Doncaster Works on April 20th 1986. Page added November 24th 2012.